We’ve moved quite a few times since we got married. I’ve enjoyed each place we’ve called home: Utah, Washington, Texas, and Arizona. Each place marks a different focus of my creative journey, and our family’s season of life. We recently moved to San Jose, CA four months ago, and this time was a bit different because as we were house searching, finding a place for my studio was actually a priority. In all the places we lived before I was happy to turn a spare bookshelf, closet or storage room into a makeshift creative place… you don’t need much space to be creative! However, this time it played an important role in our search. My teenage self would think this was a dream come true! We ended up in a sweet mid century home with the perfect amount of space for our family. It is small and old but I am able to have two rooms set apart specifically for Hello Hydrangea. One as my studio and the other as my office. My studio has a small closet in the corner with mirrored doors, which I love, because they make the room feel a bit bigger and help reflect light around the room. Surprisingly, the dining room has the BEST light of the entire house, so I do most of my filming there, when I need to! I love having all of my supplies available at hand, so I built some long bookshelves to store yarn, rope, fabric, dowels, metal shapes, books and packaging materials. 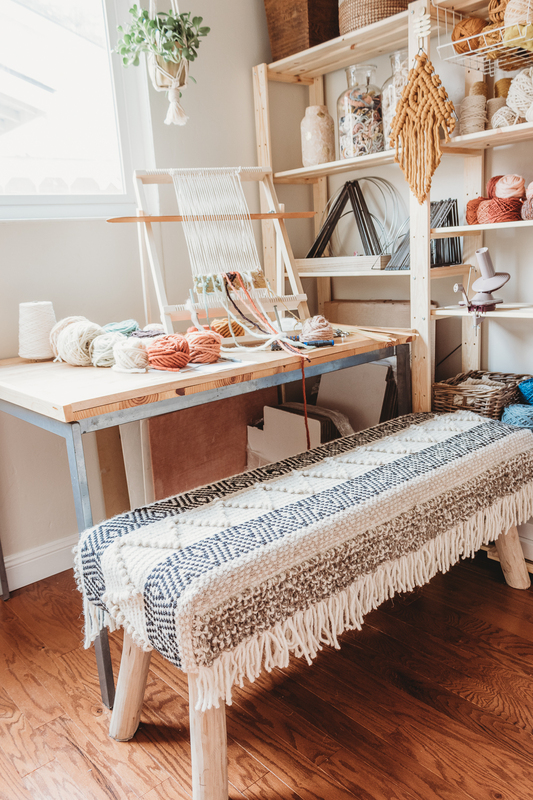 I have some glass jars to keep my yarn and rope remnants in for recycling and installed a long bar on one wall to hang my looms off the ground for protection. I also brought a meaningful antique dresser that was passed down from my grandparents. It’s very old and has a love note on the back from a husband to his wife on her wedding day. My goal with this room was to make a creative space where I felt organized, peaceful and most of all inspired. My materials are some of the things that inspire me the most, so having them out on display, instead of packed in a closet is one of the best ways to feel motivated and ready to create every time I walk into the room. It doesn’t matter what type of space you have to create in. You don’t need much room or many supplies - all you need is an idea and an outlet to be creative. I began Hello Hydrangea back in 2011, When my husband and I were first married, and we lived in a one bedroom, 400 sq ft apartment. Find something that inspires you and fuels your desire to create, and you can do it anywhere!